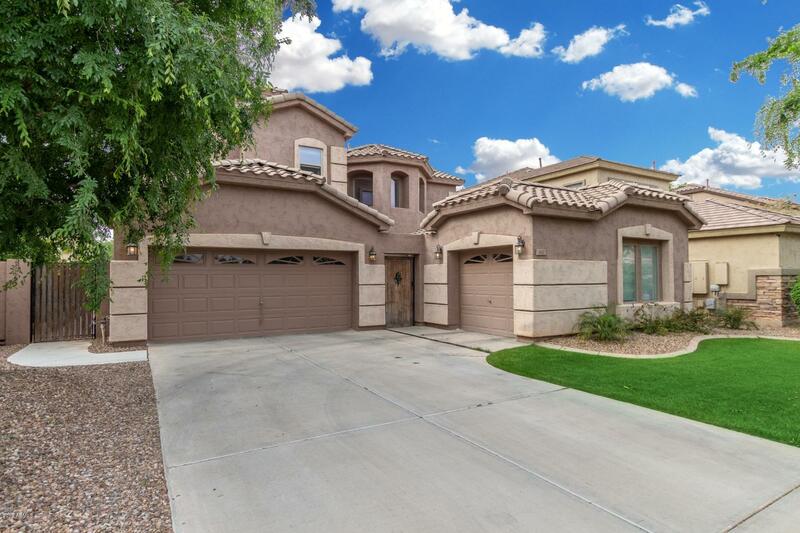 Carve out an incredible life in this stunning 2 story home that is nestled in the amazing city of Chandler! Upon entering this home, you are greeted with gorgeous tile flooring, soft paint palettes, soaring vaulted/cathedral ceilings, sprawling staircase and an open floor concept. The kitchen boasts farmhouse blue cabinetry, SS appliances, tiled backsplash, granite countertops, walkin pantry and plant shelving. Upstairs you will find the loft area that is ready for your personal touch! The spacious bedrooms offer plenty of room for sleep, study and storage. The master bathroom showcases a garden style bathtub, dual sinks, separate shower and a walkin closet! Out back is a non GMO, organic garden. Easy freeway access and close to all of the shops and restaurants at the Chandler mall. The covered back patio overlooks the expansive backyard that is comprised of a putting green and a basketball court-a perfect setting for sports fans! Don't hesitate! Book your showing today! This home is everything you've been dreaming of and so much more! © 2019 Arizona Regional Multiple Listing Service, Inc. All rights reserved. All information should be verified by the recipient and none is guaranteed as accurate by ARMLS. Information deemed to be reliable but not guaranteed. Real estate listings held by brokerage firms other than RE/MAX Infinity are marked with the ARMLS logo and detailed information about them includes the name of the listing brokers. Listing broker has attempted to offer accurate data, but buyers are advised to confirm all items. Only IDX residential listings are displayed on this site. The information being provided is for consumers' personal, non-commercial use and may not be used for any purpose other than to identify perspective properties consumers may be interested in. This site will be monitored for 'scraping' and any use of search facilities of data on the site other than by potential buyers/sellers is prohibited. Information last updated on 2019-04-24.